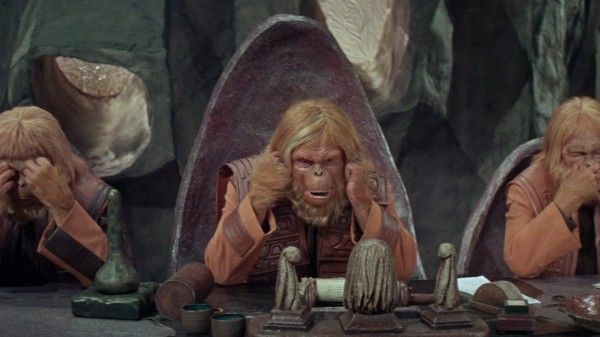 Planet of the Apes, in addition to being one of the best and most enduring sci-fi films ever made, is also one of the genre’s most cynical, pessimistic, and depressing entries. We tend to gloss over that aspect because it’s tempered with people dressed up as apes. 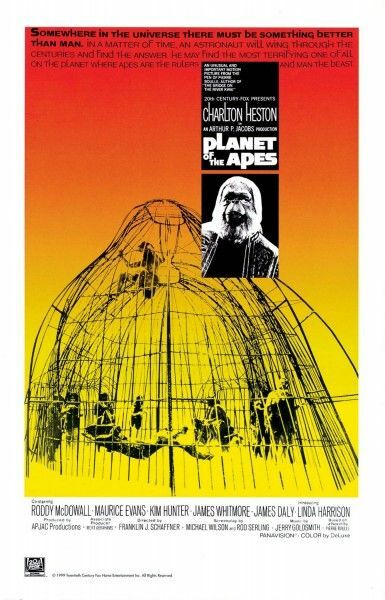 Wearing an ape costume really relives a lot of the tension, and turns Franklin J. Schaffner‘s classic 1968 film into a subversive piece of entertainment filled with action and suspense. These elements are essential in a film that eviscerates not only the prejudices and conflicts of the 1960s, but the inequities and shortcomings we continue to experience almost 50 years later. Astronaut George Taylor (Charlton Heston) and his crewmates Landon (Robert Gunner), Dodge (Jeff Burton), and Stewart (Dianne Stanley) have left Earth in 1972, and because of Einstein’s Law of Relativity, they don’t expect to return until 2673. However, their ship inexplicably crashes on an alien planet in the year 3978. Stewart has become a mummified corpse due to a crack in her hibernation chamber, so Taylor, Landon, and Dodge head out into the alien landscape to explore and find a way to survive. As they come upon a fresh water supply, their clothes and resources are stolen by an indigenous people, but that turns out to be the least of the astronauts’ worries. They’re soon hunted down by talking apes that ride on horses, wield guns, and use nets to ensnare the hapless humans. In the ensuing chaos, Dodge is killed, Landon is separated from the group, and Taylor is injured and captured. From there, the movie becomes a battle of wills between Zira & Cornelius and Dr. Zaius (Maurice Evans), the civilization’s “Minister of Science” but also the “Chief Defender of the Faith”. Sentenced to be castrated, Taylor manages to escape once more, this time with the help of Zira, Cornelius, and Zira’s nephew Lucius (Lou Wagner). Although they’re hunted down by Zaius and the police, Taylor manages to get the upper hand. After going into a cave, Taylor and the scientists learn that human civilization preceded apes, a revelation that directly contradicts the apes’ “Sacred Scrolls”. When the police do return and close in on the group, Zaius allows Taylor and fellow human Nova (Linda Harrison), a beautiful and mute native, to leave and go deep into the Forbidden Zone. The reason I’ve provided an extended synopsis is that there’s so much to unpack with this movie. To begin with the ending, I’ll never know the power of the film’s famous twist. I can only imagine how audiences felt when they saw it in 1968 and how many viewers were able to predict that Taylor was on Earth the whole time. Even as new hints are revealed, those hints can be couched in hope. Perhaps mankind colonized a new planet, but ultimately perished. We had lofty ambitions, but they didn’t pan out. Instead, we get a much darker conclusion. Mankind used its technology not to reach outward (beyond Taylor and his crew leaving Earth with a plan to see how the world had changed over the course of 1,000 years), but to destroy the planet. Using the Statue of Liberty doesn’t just provide an instantly recognizable landmark. It also conveys the failing of America. One of our most noble symbols lies in ruin, one of the movie’s many pointed examinations of our country’s failings in 1968. Planet of the Apes is filled with social commentary, and arguably its most notable subtext is its exploration of the civil rights movement. The movie provides a strong contrast against another famous picture featuring primates, or rather, a single big one: King Kong. The 1933 film is terrific, but it also contains the disturbing subtext of white fears of black men (African-Americans have been the target of racist stereotypes depicting them as simian, i.e. a less-evolved species than whites) sexually assaulting white women. Planet of the Apes turns the trope on its head by having the apes stand in for racist whites while white men and women are treated as the lesser species. One could argue that this is just an updated version of white fears with the apes now standing in for the Black Power movement. However, the film doesn’t support this conclusion. In addition to the other progressive values the movie celebrates (“Remember, never trust anybody over 30,” Taylor tells Lucius), the apes utter lines that are usually attributed to racist whites. At one point, Cornelius tells Zira that humans are “natural born thieves” and multiple apes talk about the lesser intelligence of their mute prisoners. It may be a “madhouse” to Taylor, but African-Americans and other minorities have had to face such madness in their daily lives. Schaffner’s film does present a nightmarish insane asylum, but it’s a mirror held up to our civilization. Taylor is already a cynic from the moment the movie begins as he tells the ship’s log that he believes the present-day is barbaric and any future civilization has to be better. But then he returns only to find a culture as brutal as the one he left. Although the movie could be broken down to simply an allegory about cruelty against animals, Planet of the Apes isn’t about a single cause. It’s about the state of the human condition and how there’s something rotten and inescapable deep down. The film pulls no punches, although it can be an iron fist in a velvet glove. 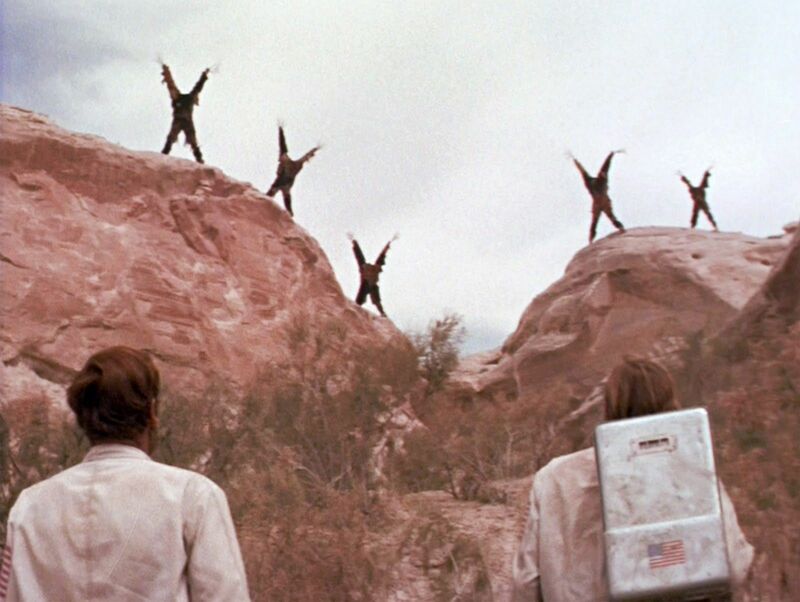 It takes half an hour for the apes to even show up, so the first quarter of the film is spent watching the astronauts trek across a barren wasteland and Taylor being a colossal prick. In an action sci-fi movie, the male lead is usually the hero, but there’s nothing heroic about Taylor other than his willingness to save Nova (and even that is powered more by a sexual motivation than any deep affection for the silent, beautiful woman). The heroes are Zira, Cornelius, and Lucius. Even when they rescue Taylor, he still acts like a jerk. He bosses them around, treats them about as well as he treated his human crew, and I was honestly surprised he even bothered to thank his ape saviors. Furthermore, he reveals that Stewart was supposed to be the crew’s “New Eve”, so she was basically brought along for the purposes of breeding. Taylor is not a “good guy” but he does provide the voice of harsh realism. Planet of the Apes acknowledges that what it’s saying isn’t pretty, but it needs to be said. These uncomfortable observations would be overbearing if not for one crucial aspect: they’re coming from talking apes. For all of the awful things the apes say and do (for me, the most chilling moments are when Landon and Dodge’s fates are revealed), they’re still people in ape makeup. The makeup is excellent considering the time period (John Chambers won an honorary Oscar for his achievement), but it’s still limited, which ends up working to the film’s advantage. Watching humans in ape costumes dulls the edge ever so slightly because we identify with them, but also have the safety of special effects providing the necessary distance. When coupled with the safety of the action sci-fi genre (the action scenes are low-scale by our current standards, but they still have energy), Planet of the Apes eases into a careful balance between satire and scathing critique. Although our culture climate has shifted over the past decades, Planet of the Apes endures, which is so very depressing. Upon re-watching the movie, I was struck time and again by the movie’s message about religious devotion overriding scientific truth. The film repeatedly points out how the apes’ devotion to the Sacred Scrolls makes them ignore obvious proof. Schaffner even went so far as having the ape tribunal parody the “Three Wise Monkeys” maxim “See No Evil, Hear No Evil, Speak No Evil”. Taylor also points out that it’s bizarre for Dr. Zaius to be both the Minister of Science and the Chief Defender of the Faith. “There is no contradiction between faith and science,” Dr. Zaius retorts. That’s a disturbing sentiment when you accept faith as science, and then reach Dr. Zaius’ decision where any scientific evidence contradicting that faith must be ignored or destroyed. Science in and of itself isn’t good or evil, but in the hands of man (or ape), it can be twisted for nefarious purposes. It spelled the end of mankind with the destruction of the Earth, and apes will be led down the same path as they engage in scientific research but bend it to religious doctrine. Returning to the racial metaphor, the Sacred Scrolls turn the apes into supporters of eugenics, which allows them to treat humans as fodder for experiments and breeding. Likewise, those who defended slavery in the American South would point to the Bible as a supporting document for their actions. Today, the science versus religion debate doesn’t circle around race. Instead, science is willfully misinterpreted in other ways. It’s used to dismiss climate change. It’s used to condemn homosexuality. And, in an appropriately ironic turn as it pertains to Planet of the Apes, science is used to “teach the controversy” that evolution is only a theory and that schools should also consider “intelligent design”. Planet of the Apes continues to endure, which is a blessing for those who can still be moved by its powerful filmmaking. It’s also a revelation of a curse. It forces us to acknowledge our prejudices, our hubris, and a host of other shortcomings that are inherent both to America and to a larger extent the human race. George Taylor may have felt like he had entered into a madhouse when he was thrown into the Planet of the Apes, but we’re the maniacs.